Goodreads: In trendy Silicon Valley, Priya has everything she needs—a loving husband, a career, and a home—but the one thing she wants most is the child she’s unable to have. In a Southern Indian village, Asha doesn’t have much—raising two children in a tiny hut, she and her husband can barely keep a tin roof over their heads—but she wants a better education for her gifted son. 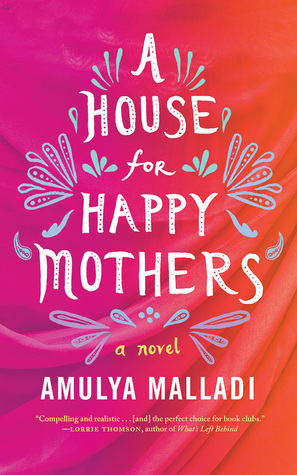 Pressured by her family, Asha reluctantly checks into the Happy Mothers House: a baby farm where she can rent her only asset—her womb—to a childless couple overseas. To the dismay of friends and family, Priya places her faith in a woman she’s never met to make her dreams of motherhood come true. Kritters Thoughts: A woman who is half Indian and half American grows up in America and doesn't know much about her mother's heritage. Her mother doesn't help much either to share her heritage with her daughter. Her husband was born and raised Indian and his parents still live over in India. They have tried many different ways to become parents and finally end up having to go the surrogate route, but not only do they go the surrogate route, they choose a surrogate from India to carry their child. Asha is the woman who chooses to be the surrogate and get paid for carrying their child. She has wishes and dreams for this money and wants to use it to better the life of her family, but there are definitely some reservations for earning money this way; at least in her mind. First, I found this book to be informative and interesting. I don't know much about the world of surrogacy and even international at that. Having chapters and portions of the book from Asha's mind made the book feel even deeper than usual as we get her viewpoint of "renting" out her womb and being paid to carry a child for complete strangers. I loved seeing the "issue" of surrogacy from both sides of the coin and seeing both the good and bad of it. In the end, I loved how Priya was able to connect with Asha and made her feel more than just an oven for the bun. I wish that each woman who chooses to be a surrogate gets the experience that Asha does with a relationship with the parents and a full experience of doing something for someone that they couldn't do for themselves. I am a fan of this one and will be pushing it on others for a good, interesting read. This certainly sounds like a book that would generate a great deal of discussion in a book club!